This site is best viewed in the latest versions of Google Chrome, Apple Safari, Mozilla Firefox, Opera, or Internet Explorer 8. Your mileage may vary in older browsers. Roundhouse, the dancing logo, and all other elements related to the show used within this site are ™ & © MTV Networks and Rebel Entertainment, all rights reserved. All copyrighted material is used solely in a non-profit manner. Since the beginning of time man has sought for bigger and better innovation. Man knew some, but wanted to know more. More is pretty ok but plenty is better. Enough is enough, but not as good as a lot, nor as coveted as too much. Man is greedy. Thank goodness for woman. One day, our average youthful protagonist was traveling through the thorny paths of young adulthood, only to discover that any query he might encounter has already been pondered by some dude at the beginning of time. This is perplexing in itself because time is typically hard to quantify, especially in the sense of “beginning” or “end.” Also, early man must have been pretty darn early. Think also that in the beginning of time man could have been mapping the heavens or learning to hunt and build and use opposable thumbs, but in actuality – and stay with me here because this is truly amazing – man was coping with his inability to listen to the advice of his baseball coach. There's more! Man was not only developing linguistics and creating a verbal language, but he was utilizing that language to arrange for a social phenomenon wherein multiple early man participants articulate at the same time to produce expressed and enumerated observations about early females and some establishment (yes, establishment!) called Hot-Dog on a Stick. Yes, they were advanced enough to have sticks. It is important to keep the sociological study of the linear works of Roundhouse ongoing, since in every chapter some new information is revealed about man at the beginning of time. 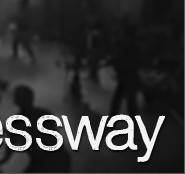 That is why the Easychair Expressway is so socially relevant. The website appears here in its new form because Mike has been wanting to apply his vast creativity to a new design since the beginning of time. Please take a while to explore our new features and flashy things. There is more information available to you than ever before, but worry not, because as I stated, more is pretty ok. If you wish to explore Roundhouse the television program and have no interest in early man, you might find this site useful anyway. If you have no idea what I've been rambling on about thus far you might get more use out of the more-straight-forward-less-obnoxious-introduction here. To the rest of you students of history and humanity, we thank you humbly for your visit. Good luck to you in your studies.